From invasion of the body snatchers to the stepford wives, this movie takes a very familiar premise and sets it in the world of high school kids, with routine and cliched results. Brief Review: a cliched movie about high school kids who are turning into monsters. whether it’s zomies or robots or aliens, we’ve seen it all before. we’ve even seeen it in a high school setting, with movies like the faculty. when the movie plays it’s mystery angle, mostly in its first half, it is kind of interesting, but as it goes on, thing just become more and more routine. you might not be able to predict the very ending, but you can definitely predict everything else. the movie is watchable and does have some merits, but ultimately it isn’t new or creative, and those are problems it can’t get around. THere’s nothing special about Disturbing Behavior. it’s a decent movie in the routine scheme of things where there’s the highschool world of segregrated groups (the jocks, the nerds), who all eat at their own cafeteria table for just their group. that’s just one of many cliches on hand here. the story is about many of the kids turning into some kind of cross between zombies and robots. it’s a kind of program or cult that the adults in the school district are willingly subjecting their kids too. and then there are the kids who have caught on and notice what’s happening to their friends all around them, and try to fight back. those are our stars of the film. it’s a corrupt conspiracy movie crossed with sci-fi monster movie elements. these kids who go through the program basically become monsters. one guys murders a girl for being slutty. another girl bangs her head against the mirror over and over again until it starts bleeding. and then there’s a story about a kid biting a head off a chicken. James marsden plays our main kid, steve. he’s the new kid in school, which means the fish out of water character, and it means that we get to take on his point of view as he is introduced to the way things work in this town. that’s another cliched move, used by movies like mean girls, and countless others. the thing is though, these ideas are cliched because they work. what better way to get the audience involved then to have a character represent their point of view of being new to this world and needing some introductions to the characters. gaving (Nick Stahl) and rachel (katie holmes) are the kids who have been there for a while. they are the other stars of the film and quickly become steve’s friends. gavin is a rebel, skateboard kind of pot smoking kid. rachel is pretty much the same way, with her pick-up truck, wife-beater shirts and nose ring. these are the kids from the wrong side of the tracks and so at first nobody pays them much mind. only gavin happens to catch something while he is out one night with his dog. gavin looks down over the side of a hill and sees two high school kids making out in a car. then he watches as the boy gets riled up by the girl’s promiscuity and ends up killing her. how gavin can see all of this, from up above, when it is all happening inside the car, i have no idea. but the next thing you know, two police officers show up to arrest the boy. the young man gets out of the car, and that’s when one of the police officers shoots the other one and then instructs the boy to drive away. this is the opening scene of the movie, and it is pretty gripping. After that we meet steve and start learning little bits and fragments of why his family moved here. it’s another cliche, hiding a secret from us about his past, and showing it only in tiny snipits and flahses that go through his head. something happened with steve’s older brother and now the family moved away. that’s reall all we know. gavin befriends steve pretty quickly, sitting down at the cafeteria table with him and talking his ear off. when he and steve walk out of the school and into the parking lot, rachel is there, getting out of her car. steve can’t take his eyes off her, and is happy to learn that gavin and her are friends. this starts the triangle of main characters who will take us through the movie. gavin tells steve about his theory of what’s happening to the kids, but steve isn’t convinced that these jocks aren’t anything more than a bunch of glorified jerks. they start fights, are overly aggressive, and destroy things for no reason, but that doesn’t mean some evil force has taken over their bodies. the big event that kick starts the second half of the movie, is that a main character is subjected to this program, becomes one of the bad guys, and throws the other characters for a spin. now, suddenly, they know that the theories are true. and so the second half becomes about them playing detective, trying to prove it. that doesn’t really get them very far, however, since everyone in the town, from their parents to the police, seems to be in on it. the only adult who isn’t is the bumbling, nutcase janitor. how creative. when our characters go running through a mental asylum (how the hell did they get in here), trying to find answers, the movie has reached it’s low point. what do they expect to find? we already know everything, and so there really aren’t any answers or mysteries left out there. luckily the movie does give a face to the lead bad guy, instead of just having the kids fight against a conspiracy and an evil force, like most zombie movies do. here, the bad guy is played by bruce greenwood, as the principal of the school who is also a doctor and the one who performs these operations on the students. 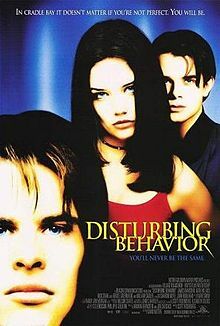 Disturbing Behavior is an okay movie, and that’s being kind of generous. it does hold your interest, but at the same time, we’ve seen this storyline many times before. a much better version of pretty much the same film, is the faculty, made by robert rodriguez. that movie played the stpryline of high school kids transforming, and corrupt adults running the conspiracy, for laughs as much as it did for thrills. Disturbing Behavior goes only for the thrills, and it doesn’t get very far. i do like the way the movie ended, and never expected such a brutal way of handling the problem, but other than a few moments like that, sprinkled around, this movie is by the numbers nearly every step of the way. it’s a decent film, but certainly nothing new, exciting, or even smart.